• The coin is premium struck for added relief and greater detail. • The coin features an elegant design that is finely engraved and meticulously presented in a reverse proof finish (brilliant raised elements on frosted background). • A distinguished addition to any numismatic collection that celebrates not only the Canadian spirit but also the exceptional craftsmanship offered by the Royal Canadian Mint. • A unique celebration of our world-renowned Silver Maple Leaf bullion coins. 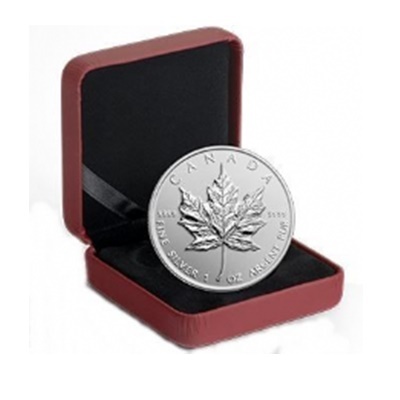 • The coin celebrates the Silver Maple Leaf’s beauty and success since its introduction in 1988. The coin is encapsulated and presented in a Royal Canadian Mint-branded maroon clamshell with black beauty box & certificate of Authenticity.